The phylum Mollusca is a very large phylum consisting of invertebrate animals. It consists of about 85,000 species. It is the largest marine phylum. The octopus, sea slug, and squid are all part of the phylum Mollusca. They have gills in order to get oxygen from the water. All octopuses have eight arms with rows of suckers on them. They do not have bones. The main part of an octopus's body is called the mantle. Inside the cavity of the mantle are the octopus's organs, including the gills and three hearts. They are vital to its respiratory system. An octopus breathes by drawing water into the cavity that is formed by the mantle. The water provides oxygen for the gills. The water is then pushed out of the body by the siphon. The gill hearts pump blood to the gills. When the blood reaches the gills, the blood dumps waste and loads up on oxygen. The oxygen-rich blood is then pumped to the 3rd heart. This heart, called the systemic heart, pumps blood throughout the squid's body. The sea slug, like almost marine gastropods, breathe with a gill. Many freshwater species, and most of terrestrial species, have a pallial lung. Gastropods with gills are paraphyletic. 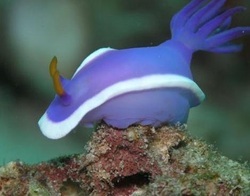 The sea slug is paraphyletic. The respiratory protein in almost all gastropods is called hemocyanin. Although, some have hemoglobin as respiratory protein. In many sea slugs, the gills are arranged in the shape of a rose. It is made up of feathery plumes on their backs. Some sea slugs have warty or smooth backs and have no visible gill organ. This means that respiration may take place directly through the skin like a sponge. Squid respire with gills. The squid has two bronchial hearts at the base of the gills. Both bronchial hearts send unoxygenated blood through the gills. Seawater is constantly circulated over their gills. The oxygen from the water diffuses across the cell wall and into their gills. Blood is pumped through the gills and picks up the oxygen and carries it throughout the squid's body. The third ventricular heart then pumps this oxygenated blood throughout the body.